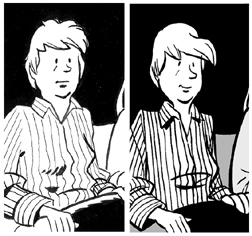 I'm annotating individual pages from my book Mom's Cancer as they are posted on GoComics.com. These are my notes on Page 2 (April 27). In answer to a question already posted on the GoComics.com page, Nurse Sis is my sister, and she's a registered nurse. You'll get to know the characters pretty well. I think this page is a fair representation of the conversation Nurse Sis and I had that night. It was about this one-sided. I didn't quite know what to make of Mom's episode or how seriously to take it. We didn't realize it was just the start. I was watching TV when my sister called, though I didn't remember exactly what. When it came time to portray it the comic, I wanted to draw myself watching some program I'd actually watch that would also say something about the "Brian" character. I settled on the "Powerpuff Girls," which a clever cartoon series my daughters and I enjoyed together, and wouldn't have been out of character for me to enjoy by myself, either. I chose that particular image because I own it--that is to say, I bought the transparent layered cels the animators drew and painted to make that particular scene. They're framed and hanging on my wall. I'll let you conclude what that says about me. By the way, owning the animation cels doesn't convey any particular right to reproduce them. 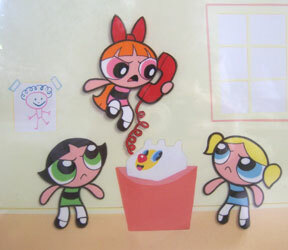 The Powerpuff Girls are copyrighted and I respect other people's intellectual property as I'd hope they'd respect mine. But Fair Use allows the use of copyrighted material in transformative works of art (Warhol, Lichtenstein, etc.) and I was pretty sure that reproducing one frame of a cartoon in tiny black and white to reveal something about a character in a graphic novel about cancer was transformative enough to pass. Just wanted you to know I gave that some thought . . .
"Last Mechanical Monster" an Eisner Nominee! 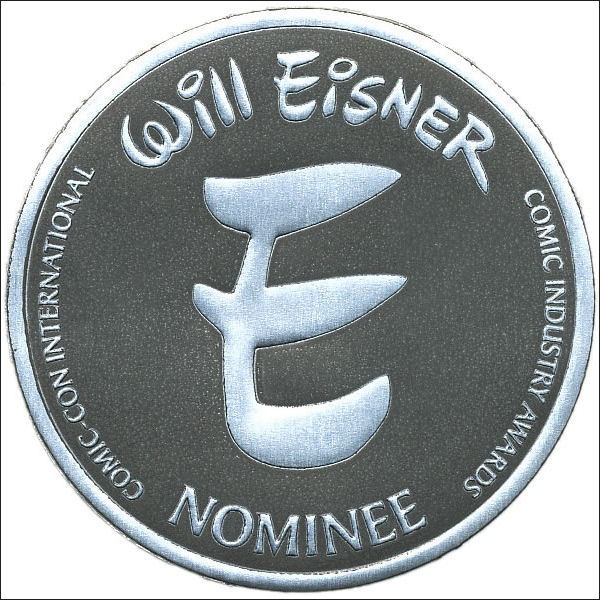 For the second year, "The Last Mechanical Monster" has been nominated for an Eisner Award for Best Webcomic! For those unfamiliar, the Eisners are sort of the Oscars or Emmys of comics. A panel of industry experts nominates comics in several categories, which are then voted on by comics professionals. Handsome trophies with spinny globes are awarded during a banquet at Comic-Con International in San Diego in July. This honor is unexpected. Each year's Eisner judging panel comprises completely different people, and I had no reason to hope that this year's panel would feel the same about my work as last year's did. Especially since the world of webcomics is so large and diverse. To be picked out of that enormous field of talent by people who know and love comics means a lot. As always, I'll hold any thoughts on the competition or my odds of winning until the voting period expires. That just seems sporting. Meanwhile, all my thanks to the Eisner judges and any new readers they've brought my way. If you're a reader I hope you enjoy the story, and if you're eligible to vote in the Eisner Awards I'd appreciate your consideration. Mom's Cancer is a true story about my mother's diagnosis and treatment for metastatic lung cancer, and how that affected our family. I first serialized it as a webcomic, posting a few pages at a time online. At first I posted anonymously; my family didn't even know. After a few months the comic went viral, I told my family, and they took the news pretty well. Fortunately, Mom loved it. If she hadn't, I would've killed the whole thing. The webcomic went on to win the first Eisner Award for Best Digital Comic and be acquired for print by Abrams Books. It's gotten some very gratifying recognition, brought me many new opportunities and good friends, and is remarkably still in print. Now, about a decade after I created it, Mom's Cancer returns to the Web. When Universal's John Glynn and I first talked about putting Mom's Cancer online, one of his ideas was to annotate the story with sketches, drafts, and my reflections on its creation. Terrific! But given how the GoComics.com site is set up, it'd be difficult to add such material without interrupting the flow of the story. So I'll try to do that here. My plan is to add a comment to each week's comic linking readers to these posts (although I don't expect to have something to say about every page). Anyone interested in the behind-the-scenes process stuff can find it here, those uninterested won't be bothered. We'll see how that works. I briefly considered setting up a separate blog for the purpose, but already have more balls online than I can juggle. These posts will all be labeled "Mom's Cancer Notes" in the right-column index so that, as they accumulate, they'll be easy to corral with a click. The story begins with Mom and Kid Sis watching a bad movie. I always felt a little guilty naming the culprit (the 2002 "Time Machine" film) but that's what it was and it truly was a bad movie. This page establishes one of Mom's Cancer's conceits from the start: the story's mostly black and white, but anything that is extraordinary, fantastic, subjective or unreal--in this case the little blue spots floating around Mom's head--appears in color. Original Mom at left, redrawn Mom at right. Thank you for reading Mom's Cancer. Please feel free to leave any questions or comments here or at GoComics.com and I'll respond as best I can. 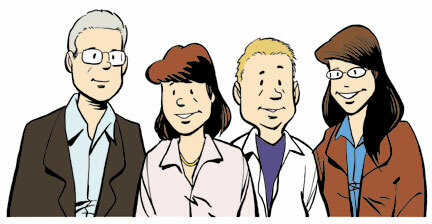 Beginning next Monday, April 20, Mom's Cancer returns to the Internet on Universal Uclick's GoComics.com. Free. I'll parse that sentence: Universal is one of the largest press syndicates in the world, providing comics and columnists for newspapers worldwide. They're the syndicate of Garfield, Dilbert, Calvin & Hobbes, Dear Abby, and my secret crush Miss Manners. Universal Uclick is their online arm, and GoComics.com is the bit of that arm (ulna?) that provides their comic strips online. Folks can set up an account to read all their favorite comics for free. They get a million visits per day. That doesn't mean that a million people are going to read Mom's Cancer. Readers have to choose it from a list and add it to their subscriptions. I hope some will. We'll see. Even a few new readers I never would've had otherwise would be better than a poke in the eye with a sharp stick. Mom's Cancer started as a free webcomic, on a primitive site I hosted myself. When I signed my book contract with Abrams, they quite reasonably asked me to take it down so my free version wouldn't compete with something they were going to ask people to pay for. I was happy to do that. Time passed. Except for a few perennial sellers, the life of a book has an ebb and flow. If you're lucky, there's a small flurry of reviews and events when the book comes out (if you're not lucky, it's just another raindrop in the lake that nobody notices). It stays on the bookstore shelves a while, then it's pulled from the shelves to make room for new books. As Mom's Cancer slid into the tail end of that curve, I occasionally broached to Abrams the idea of putting it back online. One of the paradoxical discoveries of the new webcomic era is that readers actually will pay money for a collection of work they can read online for nothing, and I thought that might help boost sales for the print Mom's Cancer. But mostly, as the book became harder to find or order in stores, I wanted the story to stay available to people who might benefit from it. Well, that broaching never went far until Universal's President and Editorial Director John Glynn contacted me out of the blue many months ago asking if I were interested in adding Mom's Cancer to GoComics.com. Why, yes indeed, I was. Acutely! I talked to Abrams, Abrams and Universal talked to each other, lawyers got involved, somewhere deep in space a hydrogen nebula condensed into a star, and at last Mom's Cancer debuts on GoComics.com next week. I think of this as Mom's Cancer's return home. We'll post a page a week, so it'll take about two years to publish the whole book. We're trying to figure out ways to add notes, annotations, sketches, etc. without interrupting the flow of the story. I have some behind-the-scenes material, plus several years of perspective, that I think some readers will appreciate. Thanks to John Glynn and Shena Wolf at Universal, and Charlie Kochman and Lindy Humphreys at Abrams. This part's going to sound sappy but it's sincere: all I want is for people who need the story to find it, and they made it happen.